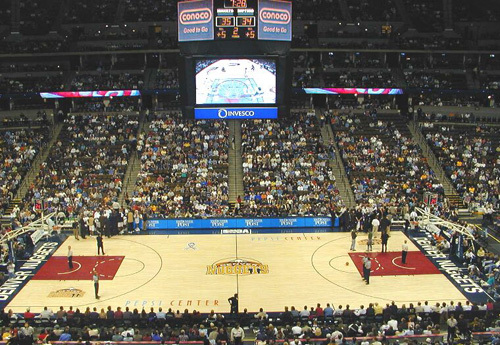 1992-1999 - Attendance for McNichols Arena, Denver, Colorado. A groundbreaking date has been set and design plans unveiled for Denver's new Pepsi Center, which will replace McNichols Sports Arena as home to the National Basketball Association's Denver Nuggets and National League's Colorado Avalanche. "The construction schedule shows us beginning in late October , running 23 months and then having the project complete by September 1999," said Tim Romani, president of Ascent Arena Company, the business unit of Ascent Entertainment Group Inc. that will construct and operate Pepsi Center. The three-concourse arena is scheduled to be open for the first Avalanche game in October, Romani told Amusement Business. It will seat 19,309 for basketball and 18,129 for hockey. Concert capacity will be 21,000. Between 160 and 200 events are expected to take place at the venue each year, including sports, concerts, circuses, ice and family shows. * Two six-story atrium entranceways and views of the Central Plate Valley, downtown Denver and the Rocky Mountains. * A 236-seat club level restaurant. * 95 fully furnished luxury suites located on two levels. The suites are expected to generate $15 million in annual revenue. * A full-sized NBA practice facility. * 4,200 parking spaces on site and 2,200 shared spaces with the Elitch Gardens amusement park. A pedestrian walkway will connect the arena to the park. * A fully-equipped and integrated production studio. * A center-hung video scoreboard. * 17 permanent concession stands which include 150 points of sale, plus numerous concession stands. * 41 restrooms - 18 for women, 18 for men, and five for family use. * Separate locker rooms for the Nuggets and Avalanche, four auxiliary locker rooms and four entertainer dressing rooms. * 20,000 square feet of administrative office space at the service level and mezzanine and 2,400 square feet in the ticket lobby. * A 3,000 square-foot novelty store at the grand atrium and five novelty stores on the concourses. * Six fully enclosed truck docks. The building's exterior color scheme will feature a red brick tone, intended to reflect the historical nature of the old railroad yard and the neighboring brick buildings remaining in the area. A dramatic canopy at the north entrance aims to accent the elevation with a downtown exposure. Ascent, which is privately financing the arena, also plans to develop land adjacent to the arena. The project may include a mix of specialty retail, restaurant and office projects totaling nearly 200,000 square feet. August 13, 1997, Denver Post Online - Everyone likes moving into a brand new house. Denver Nuggets and Colorado Avalanche players can't wait for the day, probably in 1999, they can call the Pepsi Center their new home. So-called state-of-the-art sports facilities, such as America West Arena in Phoenix and the Rose Garden in Portland, Ore., pamper players with such amenities as therapy pools, swimming pools, saunas and steam rooms, fully equipped training/treatment rooms and workout facilities rivaling the most exclusive health clubs. They have separate, dedicated practice facilities and spacious, luxurious locker rooms. Plans for the Pepsi Center call for such amenities. Avalanche coach Marc Crawford said he tired of hearing complaints from visiting coaches and players about sub-standard facilities at McNichols, everything from the arena's ice-making capacity to the location of the locker rooms and the size of the dressing facilities. "We're the people on the front line,'' Crawford said, "from guys complaining about McNichols, from the dressing rooms to the other facilities. It will be great to have something to be proud of. Former Nuggets coach Bill Hanzlik said he will be happy to make some recommendations about the team's facilities. "I'll definitely offer my advice, if they want it,'' Hanzlik said. "And I'm going to have to tell all our players to work hard so they can be part of the team when we move in there. Moving from McNichols Sports Arena to the Pepsi Center, Hanzlik said, will be akin to moving from a tenement slum to a Cherry Hills mansion. "If you want to rank McNichols, compared to the rest of the league, bottom of the barrel is where you'd have to start,'' Hanzlik said. NBA commissioner David Stern called getting the teams out of McNichols nothing short of an economic necessity. "Everybody understands,'' Stern said, "that cities like Salt Lake City, Portland and Denver are cities that need to have the latent economic benefits of state-of-the-art facilities .�.�.. club seats, suites and an entertainment center that draws people. While the arena won't be open before the 1999-2000 season, its plans immediately will become a "recruiting tool'' in efforts to lure free agents to both teams. The train of events that led to this special evening actually dates back some five months prior to our Nuggets visit. Shortly after our return from our first Denver visit we were made aware of a former Western NY'er working within the Avs/Nuggets organization. Phil Kosobucki, Director of Fan Development for the Nuggets and the Avalanche. He was born and raised in Cheektowaga, New York, is a Depew HS and University of Buffalo graduate, and his career path has taken him to Denver. We made a note of it at the time and on our return visit we hoped to connect with Phil. To put it mildly, thanks to the efforts of Phil and many others, our day at the Nuggets game surpassed all of our wildest expectations and made stop #100 the mother of all venue visits!!! Our story goes as follows?. In the weeks prior to our arrival at the Pepsi Center, we kept in touch with Phil. We had already purchased our tickets online for the game and it would be our hope to maybe get access to the club level for this particular event, something we did not have the opportunity to do in our first visit back in June. After a couple of email exchanges we learned that yes, we?d have access to the club level and oh, by the way the Nuggets radio team would like to know if a pre game interview would be possible. We agreed to do just that, and with this knowledge in mind we were absolutely beside ourselves with glee as we headed to the Pepsi Center for the nights festivities. Little did we know that it would be only the tip of the iceberg as far the experience of this evening was concerned. We arrived approximately an hour before gametime for our short interview with Nuggets play by play man Jerry Schemmel , and things went well there. Getting to chat with people about our travels is always something we enjoy doing, regardless of whether it is over the air or with fans on the street. After the conclusion of our time there, we had a couple of bombshells dropped on us. Number one, we had our seats upgraded to courtside for the game and number two, in honor of the Nuggets being our 100th team we were selected to take part in a pregame ceremonial tipoff wearing autographed jerseys of Nuggets stars Antonio McDyess and Nick Van Exel. What a huge honor!!! As much as the D-Rays experience was a special one back in September, the Nuggets may very well have topped these efforts on this night. Food and drink were complements of the Nuggets and we were also invited to take part in the Nuggets halftime slam dunk contest. Andrew prudently declined this offer while Peter accepted, and to the entertainment of the audience he showed everyone exactly why he watches the game from the stands and usually is not part of the action on the court. SPLAT! Definitely not an Ultimate Sports Road Trip Hall of Fame moment, but fun none the less. We did plenty of wandering around the venue and just like at the Trop, we were stars. People stopping us in the hallways to chat with us about our journeys...we can't spend too much time doing that!! No autographs given this time though!!! The game was a good one for the Nuggets, as they won handily over the Toronto Raptors on this night (extending the USRT home team win streak to five). Unfortunately, right now there don?t seem to be many people in Denver who are paying attention to this team, and that's a shame. Because make no mistake, this team may very well be on the upswing. With the addition of veteran point guard Avery Johnson to a nucleus of young, talented players that won 40 games last season, this is a group that could erase some of the dismal memories of recent Nuggets past, and a return to the post-season could be in the offing for the first time since 1995 here in the Mile High City. As we stated before, we were able to get passes to the club level to get a look at what the Pepsi Center has to offer. We were floored at the ambience, color and design of the concourses in the 100 and 300 levels, and the club section offers similar superior design. Every few sections one can find an upscale concession station, offering premium desserts, Mexican fajitas, and yes, even one with Buffalo wings (chicken wings, folks, not to be confused with Buffalo meat which one finds in abundance in these parts), complete with blue cheese, hot sauce and the trimmings. Along one sideline is a beautiful restaurant and bar sporting a terrific view of the outdoors and offering a premium buffet. If we had one criticism, it was that the walls were sort of bare, devoid of any advertising or murals. We would suggest some sort of "great moments" photos or team pictures, memorabilia, that kind of stuff to jazz up the place. The Denver Nuggets have retired four numbers and hang their banners proudly from the rafters. The first name has to be that of #44 Dan Issel, now coach of the Nuggets and an icon of Denver basketball. The rest are #2 Alex English, #33 David Thompson and #40 Byron Beck. What more can we say!!! Stop number one hundred was sooooo much more than a nice even number. It was the best stop on the tour for us so far!! For their efforts, we proudly induct Phil Kosobucki and Jerry Schemmel into our Ultimate Sports Road Trip Hall of Fame?..THANKS TO ALL AT THE NUGGETS ORGANIZATION, OH WHAT A NIGHT!!!! Not much time to revel in the moment though. Monday morning awaited us with a 530 mile trek to Salt Lake City where the Utah Jazz would be our next stop. Can you believe it, we are going to SALT LAKE CITY? of all places!!! A challenge to the purchase of Denver's new Pepsi Center, the NBA Nuggets and NHL Avalanche could lead to a new owner of the properties. Shareholders say the $400 million sale to William and Nancy Laurie of Missouri is too low and are challenging the transaction in court. Bjorn Erik Borgen, the former owner of a Denver-based mutual fund company, says he will make a better offer if he is given the chance. Borgen says he and another investor were discouraged from making bids and were not allowed to complete a side deal to buy the Avalanche from the Lauries. Borgen did not say what his offer would be, but many analysts say the Laurie's offer is $150 million too low. You now have a second chance to put in a bid to purchase the new Pepsi Center in Denver which opens this fall along with the NHL Avalanche and the NBA Nuggets. The package had been sold to Bill and Nancy Laurie of Missouri for $400 million, but Ascent Entertainment bowed to pressure from shareholders and have decided to reopen bids. Shareholders felt the properties were worth more than the sale price and analysts believe they could be worth $435 million to $535 million. The plan calls for new bidders to submit their offers with the winning bid going against the Lauries in a final round. The process should be complete by August. Ascent faced several shareholder lawsuits after the original sale, including one reportedly for $440 million. John Elway is among those interested in the purchase of Denver's new Pepsi Center along with the NBA Nuggets and NHL Avalanche. The package had been sold by Ascent Entertainment to Bill and Nancy Laurie of Missouri, but stockholders balked, saying proper bidding was not done and the price should be higher. The venue and the teams were then put back up for sale with the Laurie's re-establishing their $400 million bid. Elway, former quarterback for the NFL Denver Broncos, is joined in the bid by Lars Erik Borgen, a mutual fund vendor, and George Gillette, a former ski resort owner. Two other bidders are also considering a purchase. The two are also suing the Lauries saying the couple backed out of a side deal to sell the Avalanche to them after their purchase. Bids will be accepted until July 26. After that, the high bidder will bid against the Lauries for the final purchase. A $461 million bid was enough to win Donald Sturm Denver's new Pepsi Center, the NBA Nuggets and the NHL Avalanche. Sturm's bid against Bill and Nancy Laurie was not answered, making Sturm's investment group the winner. The Laurie's originally bid $400 million, but stockholders of Ascent Entertainment, which now owns the properties, complained and the bidding was reopened. Sturm's bid bested others for the right to challenge the Lauries in a second round. The Lauries declined to rebid. Sturm, a Denver billionaire and banker, survived competing bids from former Broncos quarterback John Elway, who bid $438 million as part of an investment group; a $450 million bid by Saudi Princess Thara Saud; and Colorado businessmen George Gillett and Bjorn Erik Borgen. Construction officials say they'll be ready when the doors to the city's new Pepsi Center open for sports Oct. 13 in a match between the Avalanche and the Boston Bruins. The first opening date is Oct. 1 for a Celine Dion concert. The venue will also be home to the NBA Nuggets and replaces the 24-year-old McNichols Arena that will likely be razed to make room for a new NFL Broncos stadium. The new arena is on a 50acre site next to the Elitch Gardens amusement park with 675,000 square feet of interior space. The center has 4,400 parking spaces, with an additional 2,200 spaces shared with Elitch's. Under the agreement, Donald Sturm, who bought the teams and the arena from Ascent Entertainment, must raise all monies for the arena, but will keep all revenues. The city performed some infrastructure improvements around the site in exchange for a commitment to keep the teams in Denver until 2025. The city is also releasing the teams from leases at McNichols Arena and will rebate a portion of the property and sales taxes, including up to $2.25 million in sales taxes on construction materials. For 25 years, the owners will pay the city at least $1 million per year out of revenues generated by the facility. That figure could rise depending upon attendance. Sales taxes generated by the arena will count toward that payment. The city will decide whether to keep or raze McNichols Arena, but if it is demolished within the first four years after the Pepsi Center opens, the owners will pay for the demolition on a sliding scale based on 100% in the first year and zero after four years. The city can also book events at McNichols with a booking fee paid to the Pepsi Center, if the city keeps the arena open. The Denver Post described the arena saying, "Granite, marble and ceramic tiles abound at the facility, both underfoot and on walls. There are grand entryways, extrawide concourses, sweeping stairways, restaurants and works of art. It's also loaded with hightech gadgetry - an eightsided scoreboard, huge Sony screens for showing replays, and computers at many of the upscale seats from which fans can order food and have it brought to them." The venue has 95 luxury suites leasing for $90,000 to $185,000 each on terms of three to seven years. The 1,850 club seats lease for $5,590 to $8,600 annually. Pepsi paid $68 million for 20-year naming rights. The arena features a 3,500-square-foot business center on the club level sponsored by US West. The center is complete with Internet connections and audio/visual tools that include a high-definition plasma display screen. Kiosks allow individuals to connect to the Internet to check their e-mail. There are four rooms in the center that lease for $3,000 a day each, not including tickets or food. The Oct. 31 sale closing date for Denver's new Pepsi Center, the NBA Nuggets and NHL Avalanche passed without Donald Sturm taking possession of the properties. The deadline was extended to Nov. 10 by Ascent Entertainment Group Inc., which owns the properties, but the company issued a notice to stockholders that there is no guarantee that the sale will take place. The deal is being held up by a clause in the teams' leases that prevent them from leaving town for 25 years. City officials said they were close to a deal and believed details could be worked out this week. Attorneys for Sturm echoed that sentiment. Officials say Sturm has no problems with the commitment, but the agreement must be revised to fit Sturm, an individual, versus Ascent, which is a corporation. The city wants to make sure the term agreement is honored even if Sturm dies. Denver, Colo. - Frontier Airlines Inc., the Denver-based discount carrier reorganizing in bankruptcy, is ending its sponsorship of sports teams including the Colorado Avalanche and Denver Nuggets. Frontier rejected its contract with Kroenke Arena Co., meaning it will no longer sponsor teams that play at Denver's Pepsi Center, spokeswoman Lindsey Purves said. They include the Avalanche, the Nuggets, Arena football's Colorado Crush and the Colorado Mammoth lacrosse team, Purves said. The Avalanche and Nuggets are owned by billionaire Stan Kroenke, who also co-owns the National Football League's St. Louis Rams and has a stake in English Premier League soccer club Arsenal. Frontier had a package sponsorship to advertise in the arena and provide travel to the teams, said Purves, who declined to disclose the value of the deal. Frontier signed the agreement in July 2006 and it was rejected last Thursday. 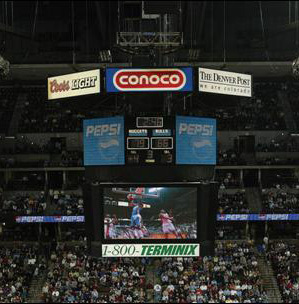 While Frontier is withdrawing advertising from the Pepsi Center, the carrier will now serve PepsiCo products on its planes after rejecting a contract with Coca-Cola Enterprises Inc., Purves said. Denver, Colo. - A reported $67.5 million in revenue bonds issued for the Denver Arena Trust LLC have been downgraded to "BBB" from "A" by Fitch Ratings. The bonds were used to fund the Pepsi Center arena. "The downgrade reflects a criteria change related to the consideration of the credit enhancement provided by the debt's legal structure, a bankruptcy-remote securitization of certain pledged revenues derived from the arena," Fitch said in a statement. "It is Fitch's view that the revenues included in the securitization, even if bankruptcy remote, are still subject to all the operational risks of the arena as a whole." Under Fitch's revised criteria, the rating reflects all operating risk of the arena with no credit given to the bankruptcy remoteness of the pledged revenues. The downgrade also reflects the performance of the pledged revenues and the uncertainty of renewals in the near term. The risks include leases for luxury suites, sponsorships and other revenues pledged to the NBA Nuggets and NHL Avalanche. "Current economic conditions indicate heightened risks for all of Fitch's sports ratings, as there will likely be increased pressure on individual and corporate discretionary spending levels and renewals of key sponsorship and advertising agreements," Fitch said. More encouragingly, Fitch noted, "Mitigating the renewal risks in the near-term is the management of the arena which has demonstrated the ability to re-sign contracts since issuance of the bonds in 1998, and the average length of contracts in hand is approximately four years. Additionally, renewal risk is mitigated by the service area's population and corporate base as well as the staggered lease expiration dates that ensure that a large percentage of contractual revenue will not expire in any given year." Security for the bonds consists of multi-year contract payments on 94 of the arena's 95 luxury suites, on-site advertising agreements with Qwest and PepsiCo, and the Pepsi Center naming agreement with Pepsico.